Adds an option for Sneak Peek in Display settings whithout any need to mce-tools. In fact, there is a built-in option for it disabled by default; this patch re-enables it. It also shows status bar in Sneak Peek due to default description saying "show time and status information". Already in Chinese (China), Danish, Dutch, Dutch (Belgium), English, Finnish, French, German, Italian, Polish, Russian, Slovenian, Spanish, Swedish. Thanks to translation team! Update for SFOS 2.1.4 however the old version still works – magic of Patchmanager! Today I tried this (v0.2) on Oneplus X community port (SFOS 2.0.5.6). Worked nicely, except the battery drain. So the phone was connected to charger overnight, and at the mornig it didn't wake up. I mean, both double tap and power key press did wake the phone, but the lockscreen was weird. There were no ambience, just white time and date on black screen. Almost like in sneak peek, but in sneak peek time and date are colored by the ambience. Also, I couldn't unlock the phone at all. Ended up rebooting, and after that everything worked fine. Nevertheless I decided to switch the sneak peek off. All this is propably well known, and I'm not blaming anyone. Just wanted to inform other OPX users about my experiences. Thanks for sharing! But please consider that this patch has nothing to do with the Sneak Peek under the hood. It just unhides the option in settings. how do I remove the patch? Deactivating and deinstalling has no effect, sneak peek still active. Disable it from Settings before uninstalling the patch. Again there's an error trying to install from repo. Anyway, thanks for status info on sneak peek. Very helpfull! Lipstick is open for everyone to share ideas. Does it work like "who made it first, will own the rest"? One day I shared my idea in a comment with you because I couldn't make an rpm package. What's wrong if I can and I do it now? And what do you mean of AGAIN, by the way? As I remember it wasn't your idea - I've just accepted your comments as patch improvements. And I think that CONTRIBUTION is right way, not DUPLICATING - "many patches with same features could turn a mess". You're totally free in your ideas and deeds. I don't want to conflict with you anyway - you're making useful stuff, but let's be more respectful to other authors and their works - I mean we can coordinate our efforts to make SailfishOS better. AGAIN = your sound's patch. Nevermind. I truly appreciate your work and to show my respect I can remove the conflicting part. You did the same for me. But about sound patch, I designed and created my own icons and wrote the patch from the scratch. It's not even conflicting with your patch, meaning that one can have them both. I'm not gonna make silly duplicates. I want to say: please don't get angry about this product of Alina. This is not the only duplicate product. Like example there's some torch applications, too. About Sneak peak Alina's version is the only version what works on my phone and I'm very pleased. Thanks Alina, and sorry Coderus, I appreciate your version, too, but it doesn't work at all on my Jolla. Now I'm delighted and relieved because now I've finally working Sneak peak option. P.S: Alina, please don't write about Coderus or anybody else on description. Try to descripe another way like example what special is in your product. In this case would be nice to write a private message to Coderus. That way you respect other developers if you're making "duplicate" product. Thanks for your support. Of course this is not a duplicate patch and I didn't even copy or see the code. This patch also shows status bar in Sneak Peek and support translations. I've written about these special offerings on first lines of description. However, I have no idea why coderus’s patch didn't work for you. Both of these work the same. agree. Having many patches with same features could turn a mess.. There are many patches with little differences or more features for different tastes, what's wrong with it? 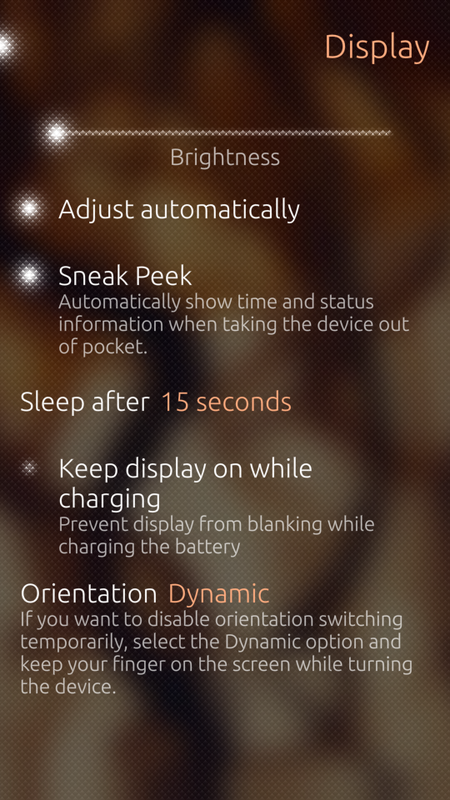 For example, you have two kinds of Power menu with and without ambience switcher. Users have freedom of choice and it's great.